If you visit a high end floral shop during the winter months, it’s likely you’ll see lots of amaryllis. Floral designers are crazy for these big-blooming flower bulbs, because the blossoms are bold, elegant and long-lasting. In the floral trade, the demand for amaryllis as cut flowers has been growing rapidly. Commercial producers have been quick to seize the opportunity, and it has stimulated a flurry of hybridizing. The result is an extraordinary range of exciting new flower styles and colors. Why not hop on this trend yourself? 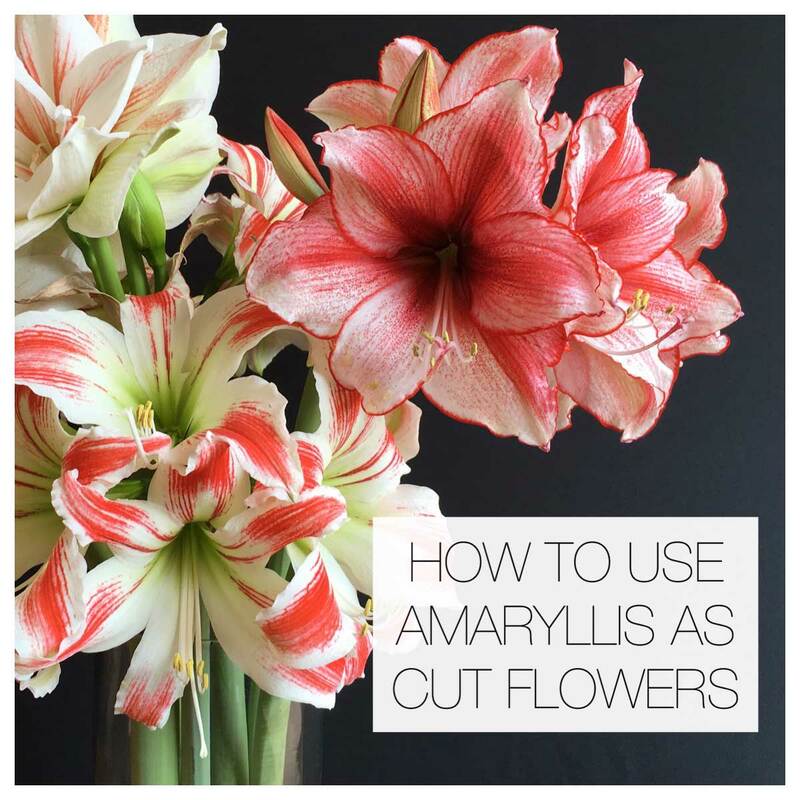 Read on to learn how you can plant some amaryllis bulbs at home and grow your own supply of fresh-cut winter flowers! Evergreen, Magic Green and Sweet Nymph in an arrangement by Alicia Schwede from Flirty Fleurs. #1 Amaryllis flowers last just as long (or even longer) in a vase as they do when still attached to the bulb. #2 Cutting stems before they bloom helps the bulbs conserve energy for future flowers. #3 Amaryllis flowers are top-heavy and when they’re in bloom, it can be hard to keep the pot upright. #4 Not everyone has a good place to display a bouquet of flowers that’s more than 2 feet tall! The double variety Nymph makes a lovely cut flower. All amaryllis look great in a vase, so choose the colors and styles that appeal to you. Some varieties naturally have shorter (or longer) stems, bigger (or smaller) flowers and earlier (or later) bloom times. The more bulbs you plant, the more options you’ll have for arrangements. Just three bulbs will yield 6 to 9 stems and between 24 and 40 blossoms! Six bulbs planted in a window box will give you many weeks of cut flowers. Most amaryllis bulbs are grown in Holland or Israel. In recent years, South Africa and South America have also begun producing bulbs for export. With amaryllis now coming from two hemispheres, growers are able to deliver a continuous supply of cut flowers, almost year-round. If you want amaryllis blooming in December, you need to plant bulbs from the Southern Hemisphere. They arrive eager to grow, and if started in October or early November, they should flower for the holidays. Bulbs from the Northern Hemisphere typically flower between January and March. The earlier you plant them, the sooner they’ll bloom. To get a succession of flowers, plant a number of different varieties and stagger the planting times. 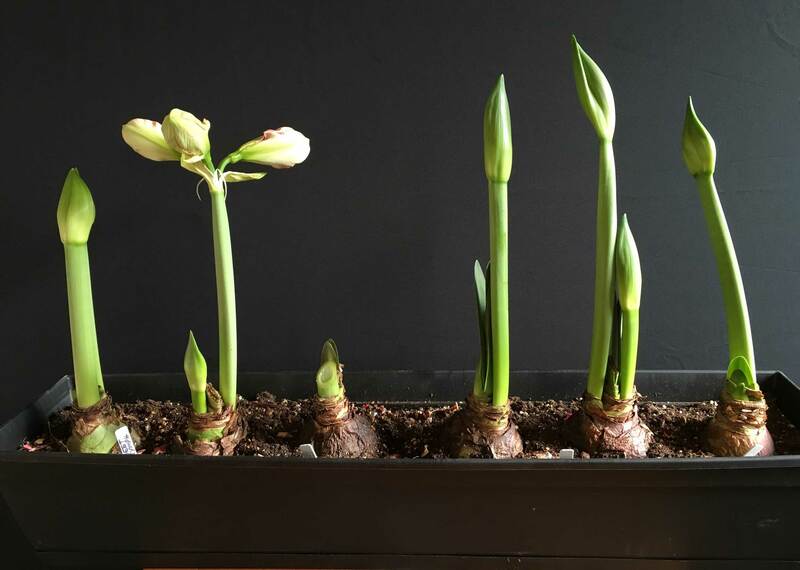 Learn more here: When Will My Amaryllis Bloom? For general planting and growing information, you may also be interested in reading All About Amaryllis or 6 Tips for Growing Amaryllis. These buds are at the perfect stage for cutting. For the longest vase life, cut the stems before the flowers open. Wait until the first buds have puffed out and are soft (as shown above). Use a sharp knife to cut the stem just an inch or so above the bulb. 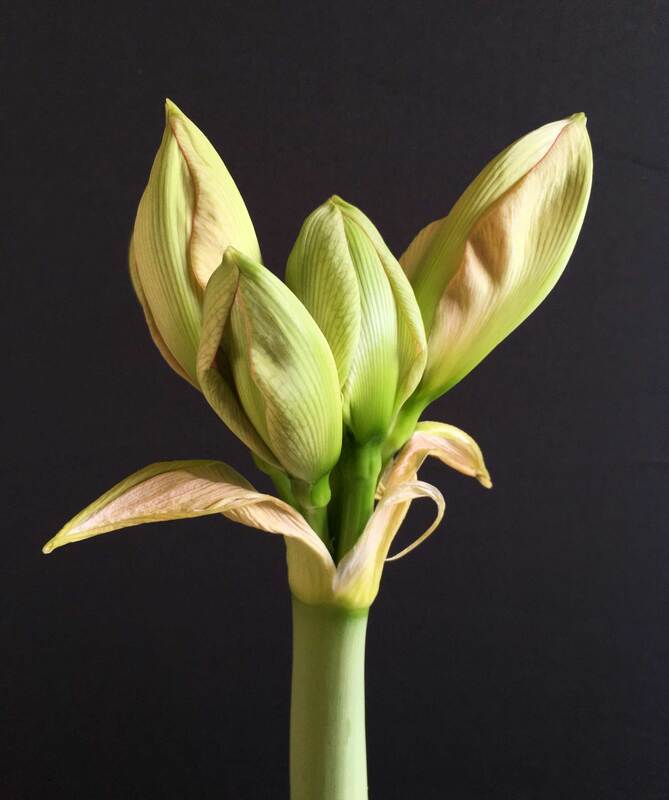 Amaryllis stems are hollow, so take care to support the stem as you’re cutting. Put the flowers in a tall, clean vase of room temperature water and then move the vase to a cool place for a few hours or overnight. 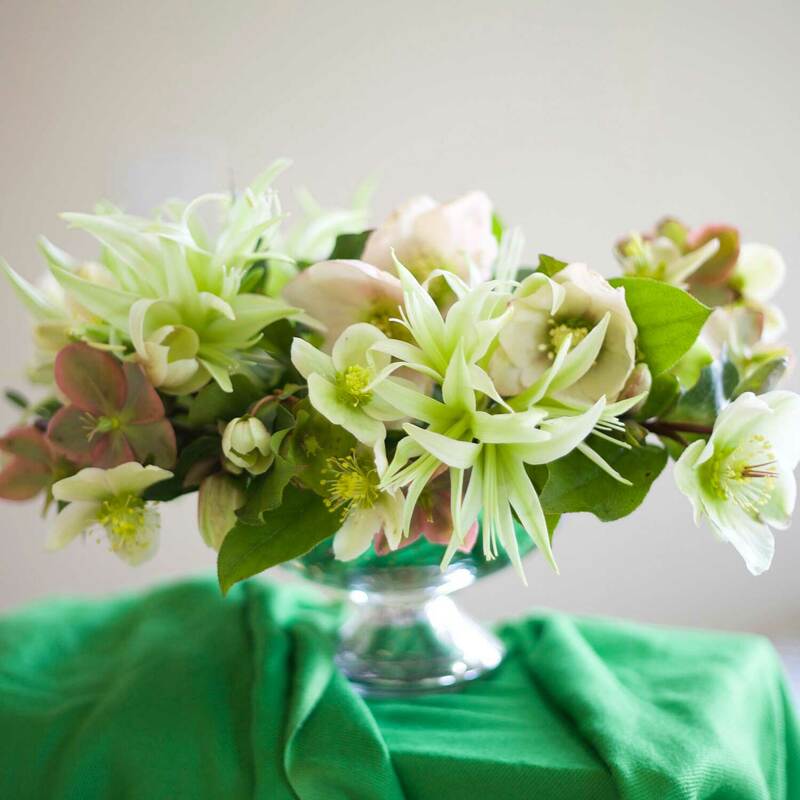 Once the flowers have rested, you can recut the stems to whatever length suits your vase or arrangement. The variety Evergreen in an arrangement by Flirty Fleurs. Amaryllis look fabulous no matter how you display them — combined with other flowers or on their own. If you plan to leave the stems relatively long, choose a vase with a heavy bottom. 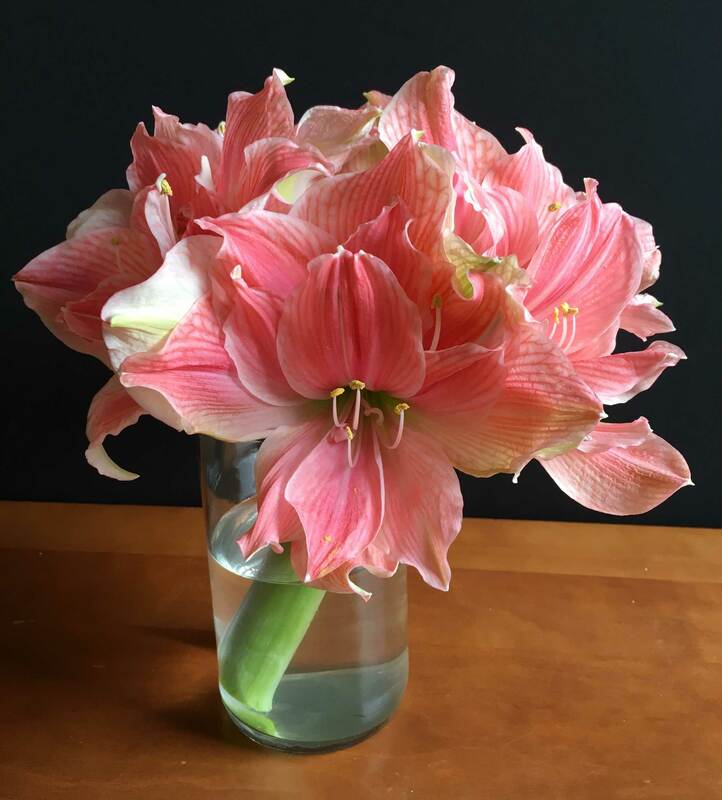 Clear vases work well for amaryllis, because they accentuate the long line of the stem. In fact, a clear glass vase works nicely even when you cut the stem very short. Change the water in the vase twice a week. Always take a few extra moments to wash the vase and remove bacteria that can clog the stems. Then add water and fresh preservative. Over time, the bottom of an amaryllis stem will tend to split and curl. Re-cutting it each time you change the water will maximize vase life. 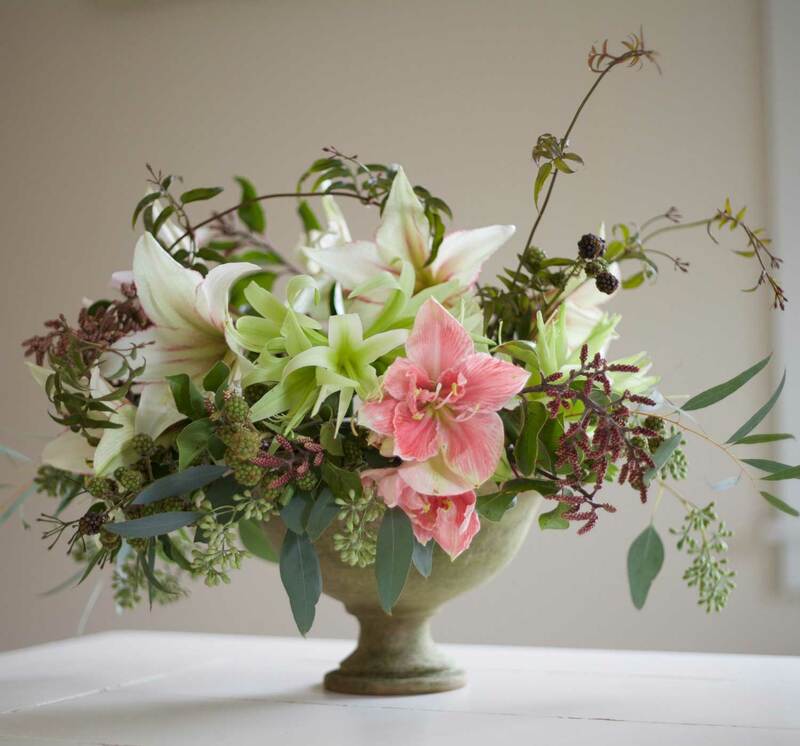 Evergreen and Benifica with tulips, hellebore, fritillaria, heather and protea. As with all cut flowers, your amaryllis will last longer if you keep the flowers cool and out of the sun. At night, consider moving them into an even cooler area — just make sure there’s no danger they’ll freeze. When the flowers begin to fade, use scissors to nip off individual blooms and give other blossoms a chance to enjoy their own moment in the spotlight. Amaryllis bulbs are available for shipping from mid-October through December. 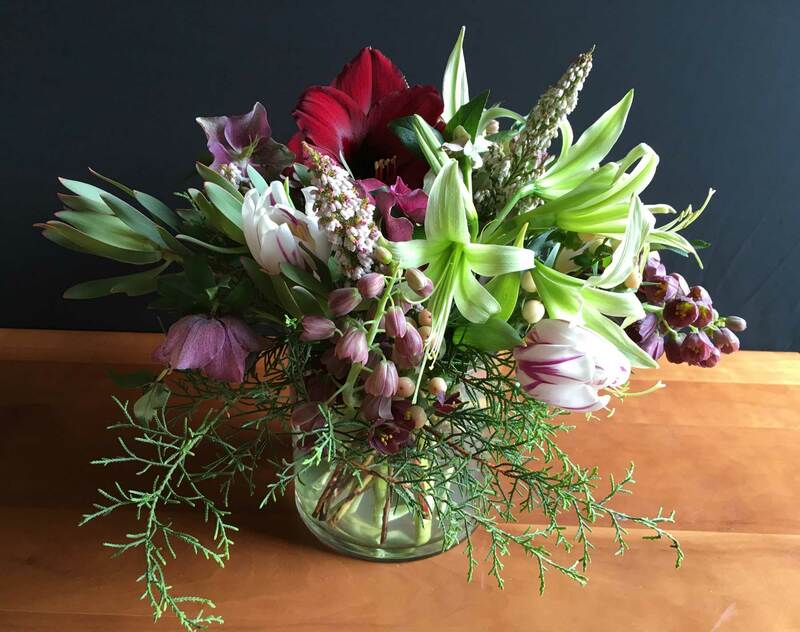 Order a few extras this year and enjoy the fun of growing and arranging your own mid-winter bouquets! You’ll find our complete selection HERE. Hi! When the buds are the perfect stage for cutting, how long does it take for them to blossom into a fairly full flower? Just trying to calculate for an arrangement I’m going to do! Thank you so much, great article! Hi Nancy! Hard to say because it depends on the room temperature. In a warm (70°+) room, the largest of those fat buds (shown in the article) would be open within 2 days. In a cool room or in a floral cooler, it could take several days longer. A sunny window will speed things along! Are amaryllis good as floating them in water? Hi Janie – Amaryllis don’t float very well due to their irregular shape. But the flowers can be displayed in a shallow dish with water covering the stem. How do Amaryllis do in oasis medium please? Hi Elaine – I asked floral designer Alicia Schwede. 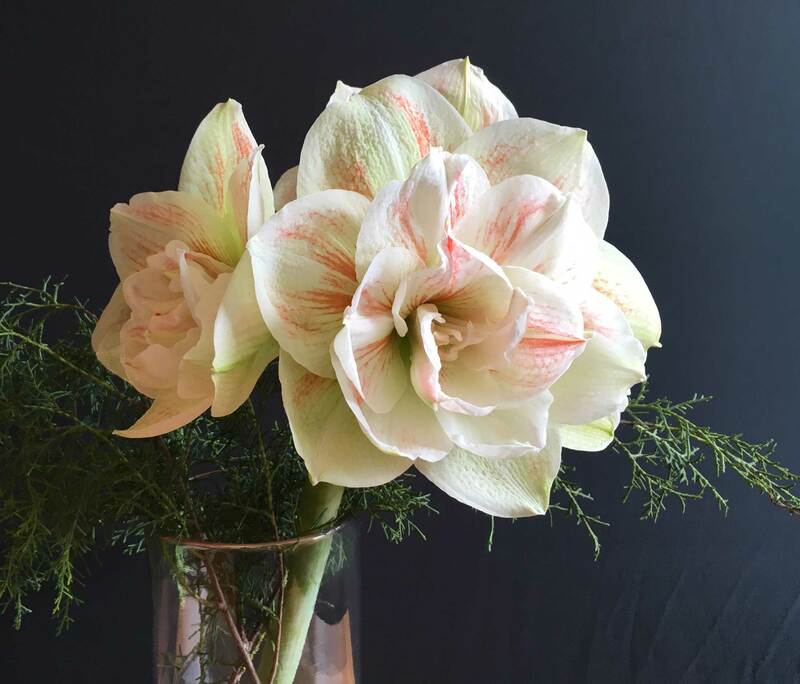 She said if you want to use amaryllis in an arrangement with an Oasis base, you will need to cut the stems to length, fill them with water and plug the end of the stem with a cotton ball. Tape on two picks to the sides of each stem and then insert them into the foam. For an easier approach, she suggested creating a twiggy framework to support the stems or make a chicken wire dome for the vase. Will smaller buds that have not swelled to size still bloom if you cut when the first buds are at size? Hi Laura – yes they will! Once you remove that first stem, the bulb will not need to support it any longer. This means it can put all its energy into the second stem. Though the blossoms are fully formed before they emerge as buds, the flowers on the second stem may grow a bit larger because they don’t need to be sharing water and nutrients.